Tshukudu Bush lodge, or “place of the Rhino”, is on a hilltop. 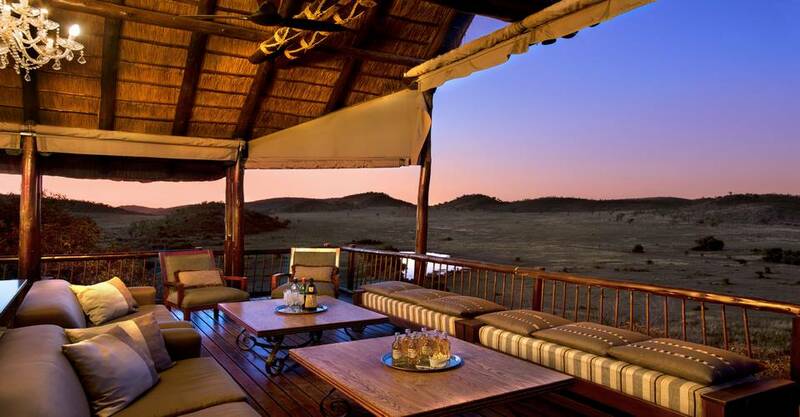 The luxurious Tshukudu Bush Lodge offers sweeping views of the malaria-free Pilanesberg National Park. This intimate lodge offers six luxury cottages, where attention to detail and personalized service is guaranteed. Game traverses the plains below and Big Five sightings are the norm, rather than the exception. To reach Tshukudu cottages, guests are required to climb 132 steps which make the area inaccessible to the physically challenged. Tshukudu Bush Lodge is renowned for its intimate setting, tranquility and superb service. Each designed chalet offers a romantic sunken bath. Open plan lounge and bedroom. A fireplace and private balcony. 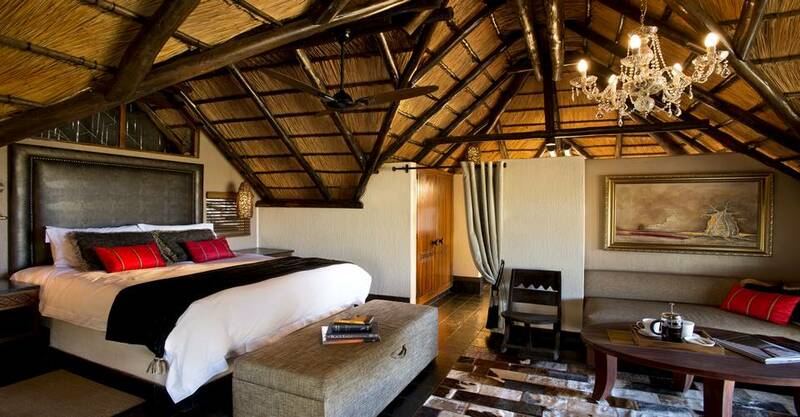 Each spacious custom-designed suite has all of Tshukudu’s finest touches as standard. This includes crystal chandeliers and rock craft fireplace. 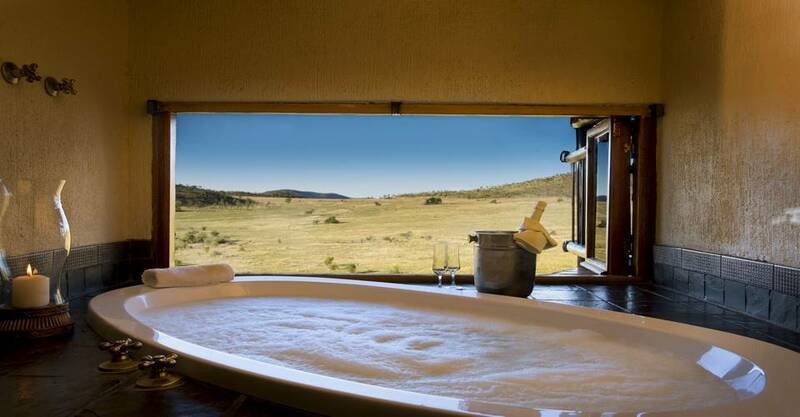 Luxurious bath overlooking the plains remains an integral feature of the bathroom and caters for a truly romantic experience. The new suites also include a private plunge pool on their secluded decks, outdoor shower and twin vanities. Tshukudu Bush Lodge is situated on an elevated hill with stunning views overlooking the natural surroundings. 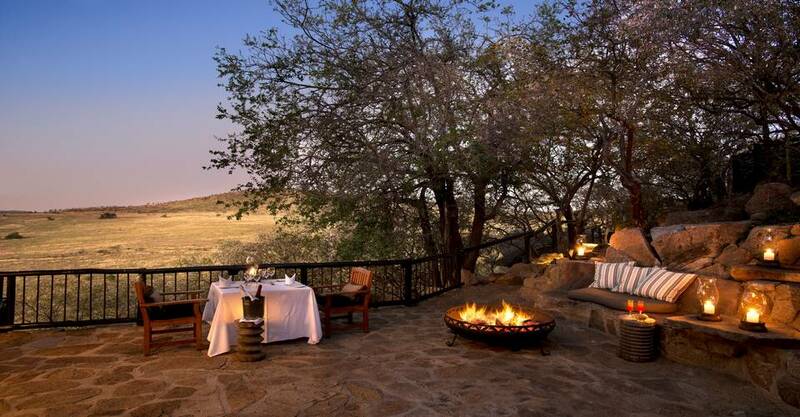 It is not uncommon to experience the Big Five from this luxury lodge. The small intimate size of the lodge is perfect for guests who seek tranquility in nature. Perfect for small groups. High tea and meals are provided on the deck overlooking the plain and a waterhole at the foot of the hill. After a delicious high tea, guests are taken on an up to 4-hour game drive in the company of field guides. Check in at Bakubung Game Lodge. Rooms have double beds, sunken bath. 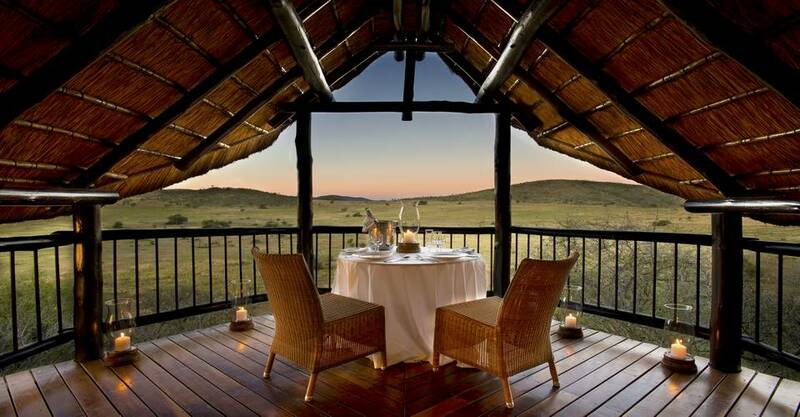 Balcony overlooking the Pilanesberg National Park landscape and waterhole. 132 stairs to climb to reach the lodge. Game drives in open game drive vehicles with refreshments. Portable screen (2m x 2m). Tshukudu Bush Lodge cuisine has a strong African influence and is prepared to five star standards. A splendid selection of wines provides the perfect accompaniment to your carefully prepared meal. 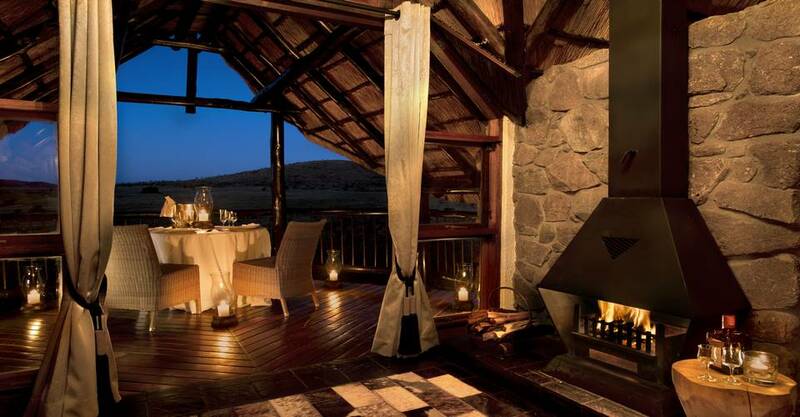 At night, sit under the African sky beside the blazing fire and listen for the distant roar of lions. Take the Sun City off ramp (R556 – Sun City/Majakaneng). 5 km past Sun City – turn right at the Bakubung sign – following the road through the village. Enter Bakubung and meet our guides for your transfer. Complimentary transfers between Sun City and Tshukudu Bush Lodge. Check out time: 11h00 am (you will be transferred back to Bakubung Gate). Children between 12–18 years of age, sharing with 1 or 2 adults in a luxury chalet, will be charged a third person supplement rate on a fully inclusive basis..